Is it possible for a summer action blockbuster to have too much character development? It can almost make the moments between action sequences almost a bore, but when the characters are CGI motion captured chimps and other primates it’s otherwise fascinating. 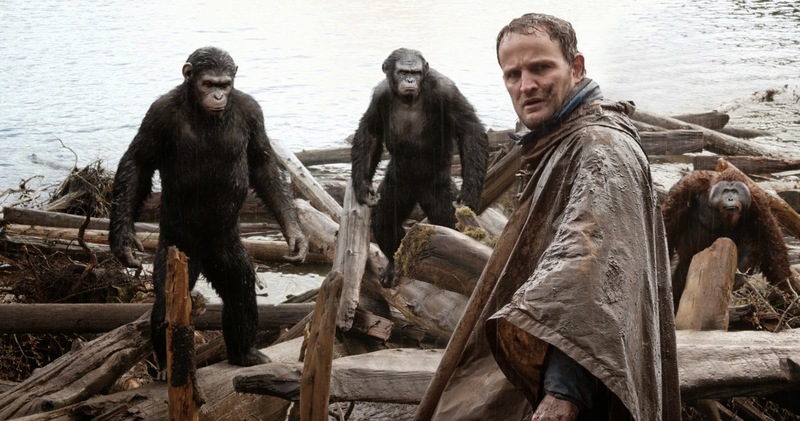 Yes, “Dawn of the Planet of the Apes,” the sequel to the surprising success that was 2011’s “Rise of the Planet of the Apes,” has it’s slower, quieter moments and it’s not the most amazing action spectacle of the summer (which probably still belongs to either “X-Men” or “Godzilla” or even “Snowpiercer”). I found the human characters significantly less interesting then their primate co-stars but maybe that’s the point? I love what “Rise of the Planet of the Apes” was leading up to. In that film, the last half hour consisted of the apes breaking out of their research facilities, breaking out their zoo brethren, and going on a wild rampage through San Francisco culminating in a fun showdown on the Golden Gate Bridge. It was a memorable movie moment. I’m not quite sure this sequel, while still very well made, can quite top anything from the first movie in terms of really memorable sequences. Set years after the first film’s simian virus, that humans created to help cure Alzheimer’s disease, wiped out most of humanity on Earth; a large group of primates have taken refuge in the forest outside San Francisco. They haven’t quite taken over the planet yet but they have created an entire society. Some of the chimps are even capable of vocalization and they can all sign to each other which we read as subtitles. There are many scenes in which the CGI animals are the only characters on screen. Though many of the apes all look alike, the visual artists and actors have done a great job of giving them distinct looks and personalities that you’re able to eventually tell them all apart. A large group of humans, led by Gary Oldman’s character Dreyfus, have taken refuge themselves within the rundown city. Caesar (another winning performance from Mo-Cap King Andy Serkis) is the lead who you’ll remember was raised by James Franco’s character in the first film. He’s sort of the Professor X of the primate world, he doesn’t quite see human as strict enemies but knows that he must protect his ape society. Koba (Toby Kebbell), the permanently disfigured ape who was poked and prodded in the facility before the events of the last movie is sort of the Magneto of the ape society. He sees the humans as beings who are strictly not to be trusted and as the enemy. Caesar allows a small group of humans, including Jason Clarke, Keri Russell, and Kodi Smit-McPhee, enter their land to get a power dam going again to the city’s electricity restored. This causes a serious conflict between apes and to put it mildly, the poop hits the fan. Soon an all-out war ensues between man and ape. I found the results rather surprising. Seeing as through this is a prequel series, we all know that eventually the apes are going to take over the planet. Though I was surprised at actually how unsuccessful they are here. At this rate, it will take about four more sequels to get to just to ‘Planet of the Apes’ status. The biggest flaw here is the rather bland human characters who are nowhere near as interesting as the CGI apes. But perhaps that’s the point. We’re really seeing this evolution, and revolution, through the apes’ perspective which is what makes this series so fascinating in the first place. Theatrical Trailer for Dawn of the Planet of the Apes on TrailerAddict.